Access-related injuries to abdominal viscera or retroperitoneal vascular structures are estimated to occur between 0.05% and 2.8% of laparoscopic procedures (27,28). While these are rare injuries, when they do occur, the consequences can be devastating with a mortality rate reported from 5% to 13% (6). A review by Chadler et al. of insurance claims and Food and Drug Administration Medical Device Reports of access-related injuries over a two-year period revealed bowel and retroperitoneal vascular injury comprised 76% of all injuries incurred in the process of establishing a primary port (6). The small bowel was the most common organ injured and nearly 50% of both large and small bowel injuries were unrecognized for 24 hours or longer. Delayed recognition, along with age greater that 59 years and major vascular injury, was an independent predictor of death. Shielded pyramidal cutting trocars were the most common trocar type associated with access injuries, and trauma from insufflation needles accounted for 18% of the injuries. Injuries were also observed with open, Hasson-type, blunt cannulas, which were associated with two deaths: one from unrecognized bowel injury and another from retroperitoneal vascular injury. The authors concluded that no entry technique or device is absolutely safe, and that access injuries to abdominal viscera and vessels may be more common than is currently reported in the literature. The open technique of gaining laparoscopic access is not without complication as noted in a report by Peters and coworkers. There is no perfect access technique and no method is risk free. The management of access injuries should focus on prevention and recognition. Administration over a four year period (30). Twenty-six (81%) of deaths resulted from vascular injuries and six (19%) were due to bowel injuries. Eighty-seven percent of deaths from vascular injuries involved the use of shielded trocars and 9% involved optical access trocars. When the diagnosis of bowel injury was delayed, the mortality rate increased to 21%. In fact, the Food and Drug Administration mandated that trocar manufactures remove the word "safety" to describe disposable shielded trocars. Laparoscopic access injuries in the urologic literature are reported as one of three injuries: visceral organ or vascular trauma, abdominal wall vessel laceration, or port site herniation. Kavoussi et al. reported 10 (2.7%) trocar-related injuries in 372 patients treated with laparoscopic pelvic lymph node dissection (18). Four of the injuries were due to laceration of the epigastric vessels, three were bladder injuries, two were due to injury to a superficial abdominal wall vessel, and one was a small bowel injury. Gill et al. noted four (2.2%) trocar injuries in 185 laparoscopic nephrec-tomy patients (7). There were two port-site hernias, one abdominal wall hematoma, and one trocar injury to the kidney resulting in open laparotomy. In a survey of pediatric urological laparoscopy, Peters noted abdominal wall herniations in 0.15% of patients (31). He also noted that significant complications occurred more frequently in patients in whom the Veress needle was used (2.55%) compared to the Hasson technique (1.19%, p < 0.006). While the type of access technique was found to be significant, the most important factor in predicting the occurrence of complications in this study was the experience of the practitioner. A recent review of laparoscopic nephrectomy revealed the potential risks involved in using optical trocars to gain primary port access into the peritoneal cavity. After insufflation is performed with a Veress needle, an optical trocar is used to visually pass through each layer of the abdominal wall. The proposed advantage of the optical trocar is that direct visualization while passing the trocar should allow identification of intra-abdominal structures and thereby decrease the risk of injury to viscera. Thomas reviewed 1283 urological laparoscopic procedures and found four (0.31%) injuries due to optical trocars (32). Two injuries involved the epigastric vessels, one involved bowel mesentery, and one involved bowel. Siqueira et al. reported three (1.4%) access-related injuries from optical trocars in the series of 213 patients (3). 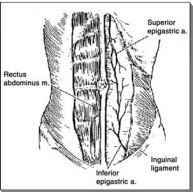 One injury involved laceration of the inferior epigastric artery, which resolved with conservative treatment. The other two injuries involved the liver while passing an optical trocar. Both injuries were managed conservatively. Orvieto et al. recently reported an aortic injury from an optical trocar during laparoscopic radical nephrec-tomy (33). There was no pneumoperitoneum prior to placement of the optical trocar and the patient recovered uneventfully after the injury was treated by placing an aortic vascular stent. Injury while using optical trocars has also been confirmed in the gynecologic literature. Sharp et al. reviewed Medline, the Food and Drug Administration Medical Device Reporting, and the User Facility Device Experience databases for reports of complications from optical-access trocars (34). They found only two case reports in the medical literature of serious complications from optical-access trocars, but 79 serious complications in the Medical Device Reporting and User Facility Device Experience databases. These injuries included 37 major vascular injuries, 18 bowel perforations, 20 cases of significant bleeding from other sites, three liver lacerations, and one stomach perforation. Four deaths resulted from these complications. Clearly, this report demonstrates that optical trocars are associated with significant injuries despite the ability to see tissues during insertion, and these injuries are under-reported in the medical literature. 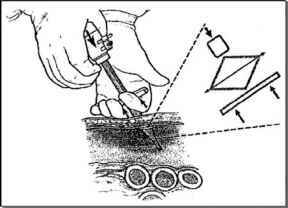 The open technique of gaining laparoscopic access is not without complication as noted in a report by Peters and coworkers (35). The injury involved a segment of small bowel, which had been included in the purse-string suture placed around the access incision. Inspection of the primary access site from a secondary trocar identified the trapped bowel and the serosal defect was repaired. The conclusions of this case report were that care must be used when placing a purse-string suture, and the initial access site should be inspected from a secondary trocar site to look for injury. Two aortic injuries have also been reported during placement of Hasson-type cannulas: one occurred due to the scalpel injury during the initial skin incision and the other due to a sharp metal burr on the tip of the cannula (36). FIGURE 1 ■ Proximity of the umbilicus to the aortic bifurcation during Veress needle placement. Source: From Ref. 38. The distance from the abdominal skin surface at the umbilicus to the ventral surface of the aorta can be less than 1 cm in a thin woman and children. 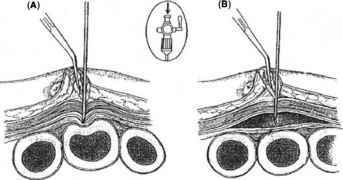 Prevention of primary trocar injury requires knowledge and control of the axial forces at work during application of the trocar. FIGURE2 ■ Visceral deformation of displacement (A), and the importance of having an open stopcock for air entry (B) to allow omentum and bowel to drop away from the elevated ventral abdominal wall. Source: From Ref. 6. Risk factors for intra-abdominal injury during closed entry techniques include thin patients, patients with previous abdominal surgery with adhesions, and application of excess axial force. Another important factor that influences trocar-related injury is the experience of the surgeon (31). 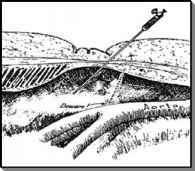 Dixon reported seven iliac vascular injuries due to trocars or Veress needles during general surgical procedures, and inexperience on the part of the operating surgeon was demonstrated in all cases (37). If a closed entry technique is employed using a Veress needle and blind primary trocar, then prevention requires clear knowledge of the underlying anatomy and their proximity to landmarks on the skin (Fig. 1). The distance from the abdominal skin surface at the umbilicus to the ventral surface of the aorta can be less than 1 cm in a thin woman and children (39). Some have abandoned the use of the Veress needle in thin patients and recommend an open Hasson technique (5). Others have suggested avoiding midline access altogether because of the potential risks, and advocate primary access in the left upper quadrant (40). If a patient has an incision from previous surgery, this area should be avoided and primary access should be obtained in a location remote from the incision, or an open access technique should be employed. While the Veress needle may be smaller than a trocar, complications can occur with this device, and the Veress needle accounted for 18% of access-related injuries in a report by Chandler et al. (6). Veress needle placement was perceived as the most difficult aspect of laparoscopy as noted in a review by See et al. (41). Some have proposed that because of the smaller size of the Veress needle, injuries caused by these needles may be observed. However, Dixon and Carrillo reported three Veress needle injuries and all required immediate exploration and vascular control for resolution (37). He also notes that there may be multiple unrecognized injuries to surrounding structures and this warrants exploration. When a Veress needle is passed, the abdominal wall should be elevated with penetrating towel clips and the Veress needle should be left open to permit air to enter the peritoneal space and allow the bowel and omentum to fall away (Fig. 2). Before CO2 insufflation, aspiration, irrigation, reaspiration, and drop test should confirm the location of the needle. Any question as to the location of the needle should prompt removal. Once the needle is felt to be in the correct position, CO2 insufflation should be started at low flow (1-3 L/min) and the initial pressure reading from the needle should be noted. A pressure reading greater than 8 to 10 mmHg or an occlusion reading from the insufflator should prompt the slow retraction of the needle until the pressure reading is acceptable. It is also important to communicate with the anesthesiologist at this time to inform them that insufflation is underway so that close monitoring can be performed. Any sudden change in the hemodynamics of the patient or end-tidal CO2 reading should lead to cessation of insufflation. If vascular of bowel injury is suspected during Veress needle or primary trocar placement, immediate conversion to an open procedure should be performed. While a bowel injury may be recognized laparoscopically, the full extent of injury may be underappreciated by the view from the laparoscope and combined injury of bowel and vascular structures are well documented. A thorough understanding of the anatomy of the anterior abdominal wall can minimize injury to abdominal wall vasculature during trocar placement. used then the skin incision must be wide enough to allow the trocar to pass easily. The abdominal wall should be stabilized with towel clips and the angle of passage should take into account the underlying anatomy. Axial force control at this point is key and can be degraded by positioning that requires more muscle recruitment to exert a given amount of force, i.e., having the table too high, or reaching across the patient to put in a lateral port. Once the primary trocar is placed, its position should be confirmed immediately by passing the laparoscope through and observing for underlying injury. Secondary trocars are passed under direct vision, but care must be exercised during this procedure because injuries have occurred with secondary trocars, including injury to retroperitoneal vascular structures (6). 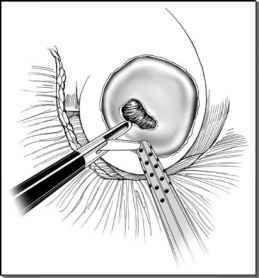 Once a secondary trocar is in place, the primary entry site should be viewed to look for injury. In an effort to redirect axial force during trocar placement, radially expanding trocars (Fig. 3) have been developed and have been shown to be safe with a very low incidence of injury (6,43). If the open, or Hasson, technique is used to gain access, care must be taken to avoid underlying bowel during the creation of the incision because exposure is limited. One of the criticisms of the Hasson technique is that there is loss of CO2 from the can-nula site, which can decrease the working space. Some surgeons have attempted to solve this problem by placing a purse-string suture around the cannula site. However, care must be exercised because complications have been reported with this technique as noted previously (35). If vascular of bowel injury is suspected during Veress needle or primary trocar placement, immediate conversion to an open procedure should be performed. While a bowel injury may be recognized laparoscopically, the full extent of injury may be underappreciated by the view from the laparoscope and combined injury of bowel and vascular structures are well documented (6). A high index of suspicion is required to recognize bowel injury due to trocar placement, because nearly half of all bowel injuries (47% for small bowel and 49% for colon) went undetected for 24 hours of greater, and delayed recognition of injury was an independent predictor of mortality (6). Vascular injuries due to trocar or Veress needle misplacement may go unrecognized for some time because of overlying mesentery and bowel, and the retroperitoneal position of major vascular structures. In addition, intraperitoneal CO2 may compress the bleeding site and a steep Trendelenburg position may decrease venous bleeding as well (5). Therefore, it is important to assess all clinical signs of the patient if access injury is suspected. Consultation with the anesthesiologist should be performed to determine blood pressure, heart rate, and end-tidal CO2. In young patients, blood pressure and heart rate may be maintained in the normal range for sometime before bleeding is apparent, and a change in end-tidal CO2 may be the best indicator of vascular insult. FIGURE3 ■ Radially dilating trocar converts axial force to a radical vector by diamond-shaped, skeletal elements embedded in an expandable sheath. Source: From Ref. 6. FIGURE4 ■ Course of the epigastric vessels in relation to surface anatomy. Source: From Ref. 44. If the epigastric artery is injured attempts at cautery are usually unsuccessful and the best method of control is suture ligation. cephalad, running between the midline and lateral boarder of the rectus muscle (Fig. 4). Saber et al. determined the position of the inferior and superior epigastric vessels relative to the midline by evaluation of computed tomography scans in 100 patients (45). They found the epigastrics were between 4 and 8 cm from the midline at five different locations along the anterior abdominal wall, and described a "safe zone" outside of this range. While these findings may be anatomically correct and useful for patients in the supine position, this may have limited application in urologic laparoscopy when many patients are placed in a modified flank position. Clearly, the midline shifts toward the downward side in the flank position and even more so in obese patients. This makes using the midline as a reference point for trocar placement problematic. The inferior epigastric vessels can be avoided by placing trocars in the midline, lateral to the boarder of the rectus muscle, or with direct visualization of the vessel from inside the abdomen. In thin patients, transillumination of the abdominal wall may allow the inferior epigastric vessels to be seen and this maneuver is also helpful to identify and avoid superficial vessels. In obese patients, the costal margin and iliac crest are usually palpable and can be used as reference points for trocar placement, because the midline is not a reliable landmark as mentioned above. This can be performed laparoscopically using a small-caliber piercing needle such as a Carter-Thomasen needle or a Stamey needle (44). The suture is passed on both sides of the bleeding site, perpendicular to the vessel. The suture may be tied on the skin over a gauze bolster or under the skin surface if the suture was passed within the trocar incision.